The year was 1969. The month was August. I was 21 years of age. The car bug had hit me again. Was it to be a Camaro, Mustang or Ford Torino? Mopar products were not even on my list. It was August and all the new '70's were hitting the showrooms. While driving by the local Mopar dealership on Kempt Rd, Halifax, something in the showroom caught my eye. I was too far by to drive in but something told me to turn around and go back. I made a turn around and headed back up Kempt Rd and turned into the Plymouth dealership. I thought as I was getting out of my mother's car, I hope none of my friends see me here. I headed into the showroom to take a quick peek. I could not believe my eyes. Here in front of me were two of the most gorgeous cars I had ever seen. 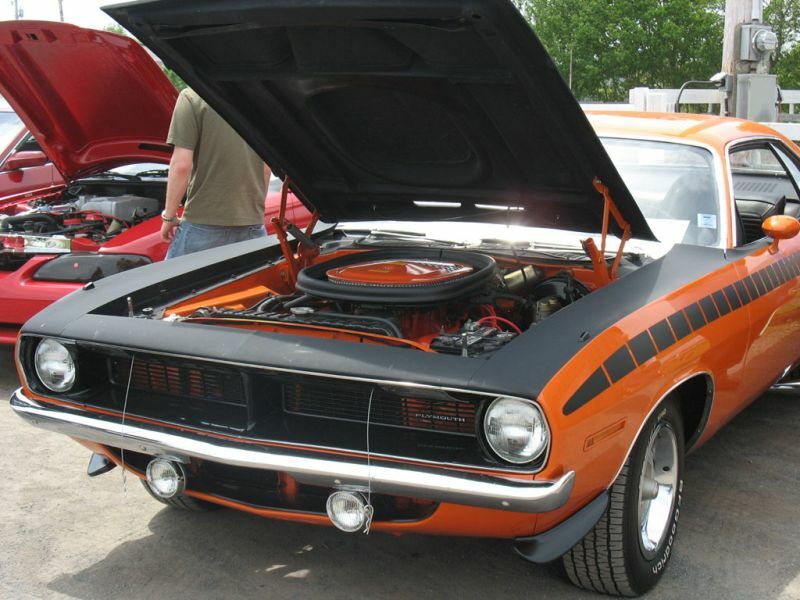 Sitting nose to nose were an orange Hemi 'cuda and a black Gran Coupe. I must have drooled an hour over that Hemi. When I left the showroom I knew I had to have a 'cuda. 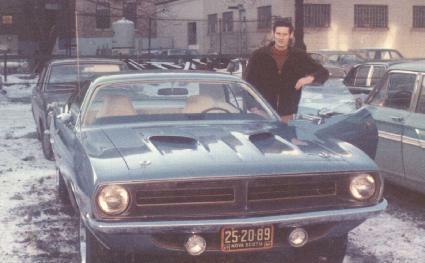 I did not have any friends with Mopar products at all. Would I dare mention to them what I had seen and what I was thinking? I did not sleep well that night. All I could think about was that orange Hemi. The next day I went back out at noon to look at the car again. There was a 'SOLD' sign on the car. This time I talked to a salesman. I quickly discovered that a Hemi 'cuda was going to be out of my price range. Well actually I didn't even know what my price range was as I had not talked to my bank. The salesman told me that they had a 340 'cuda coming in the following week and perhaps I might take a look at it. He gave me a price on it and the list of options. I went to see my bank and they gave me the go ahead for a limit not to exceed $4000. While I was waiting for the 340 'cuda to come in I thought there would be no harm in going across the harbour to Dartmouth to check out the competition. To make a long story short, they did not have anything in stock that interested me but of course, they could order one in for me. I got them to price one up for me and it come in $200 less than the other dealer wanted for the same car. They told me they could get the car in about six weeks. I ordered a blue 340 4-speed with power brakes, posi, hockey stripes, rally instruments and radio at a total cost of $3880. The wait was on. I knew it would be the longest six weeks that I would ever endure. During week five, I got a call from the dealer and it was the salesman informing me that the car was delayed because of a rally wheel shortage. He told me it probably would be another two or three weeks. I was devastated and with winter fast approaching, I wanted that car. September rolled by and so did October. I was into week 10 and no 'cuda. I called the salesman and told him I was not a happy camper. He told me that they had just received confirmation that the car had indeed been built and was awaiting shipment. He told me I should have the car in about two weeks. I was somewhat relieved but disappointed at the same time. I guess the salesman sensed that and offered to loan me a car until mine arrived. I took him up on the offer and the dealer loaned me a '65 Plymouth Fury. Well, the two weeks came and went. I called the salesman again and all he could tell me was that the car was in transit. One morning on my drive to work, I was thinking about the car and how bad I wanted it. I was starting to see a few 'cudas and Challengers around and the more I seen, the more I wanted mine. It was November 20th. As I was driving up airport hill on my way to Halifax, I noticed an auto hauler about 10 cars ahead of me. I thought, wouldn't that be something if my car was on it. When I reached the next passing lane, I headed out to catch the hauler which had slowed down due to the grade. Just as I was about to pull in behind, that was when I noticed. On the bottom deck right at the end, there it was. I knew that had to be mine. I drove up along side of the rig to see if the 340 hockey strips were there. Sure enough, they were. I slacked back and then pulled in behind him again. I knew then that I was not going to work and that I was going to follow my car to the dealership. When we got to the Bedford exit, I thought OK, he will be turning here and heading towards Dartmouth. That didn't happen and he rolled on in towards Halifax. I started to worry. Maybe the car belongs to the Halifax dealership. I continued to follow and sure enough, he headed towards Kempt Rd. I had to decide, will I continue on to work or follow him. My instincts told me to continue following him. The hauler stopped in from of the Halifax dealership and I pulled into their yard and parked. I reached the hauler just as the driver was getting down from the cab. I asked him if by any chance the 'cuda on the end of his truck was headed to Dartmouth. He looked on his clipboard and said "Yep, Banock Plymouth". I told him that it was my car and that I had followed him all the way from the airport. I asked him if he was going over as soon as he unloaded here. He said he had three cars to unload, two on top and one on the bottom. He said I have to drive your car off first before I can get the top ones off. I helped him pull the ramps back. He got a brown envelope out of the cab and pulled out a set of keys. He unlocked the driver's door and got in. The engine turned about three turns and came to life. WOW, the sound of that 340 was music to my ears. The Good Year Polyglass F-60 tires were almost wider than the ramps he was driving down. While he was unloading the other cars, he told me I could sit in my new 'cuda if I wanted. The white seats were covered with plastic and the blue carpeting was covered with paper matting. The Hurst pistol grip felt awesome. I was virtually on 'cloud 9'. It took him about 30 minutes to get the cars off and mine driven back on the bottom deck. This time, he drove it on front first. I followed him right to Dartmouth, never taking my eyes off that matt black rear and those rectangular exhausts sticking out the pan. When I got to the showroom, the salesman said, "It should be here any day now". Then he said, "Why are you smiling"? That is when he noticed the auto hauler outside. I told him I had followed the car all the way from the airport into Halifax and now to here. He told me that they would have service it right away and that it should be ready by 2 PM. I flew to the bank and got a draft and was back at the dealer by 1 PM. I forgot lunch, I wonder why :-) The technician drove the car out front at 1:30 and after a quick handshake and thank you, I was FINALLY behind the wheel of my 'cuda. It was a very long wait for a car which I loved very much. The picture above was taken on November 21, 1969.